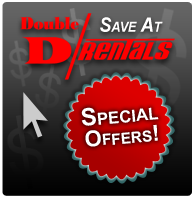 Looking for special offers on your next rental? Check out our current special and save money! We Rent Most Everything for the homeowner & contractor! Find lawn & garden equipment rentals, tractor rentals, power tool rentals, forklift rentals, and more! We Rent Most Everything for your party or event! Find table rentals, chair rentals, wedding rentals, fountain rentals, and more! At Double D Rentals, we carry haul & pour ready-mix concrete and towable concrete mixers from 1/4 yard to 1 yard. Check our concrete pricing as well as our online concrete calculator!